Do you still distress by take so many phones in the pocket, one is for barcode deck scanning camera, one is for poker analyzer, and bring many batteries for backup? As we all know those will easy to be suspected by other poker player. Are you worried about the poker scanner system react slow when the read the marked playing cards? Here comes brilliant news regarding of the poker cheating device for you. Buy marked cards has develop the 5 in 1 which means poker analyzer and poker scanner camera into one smart phone. 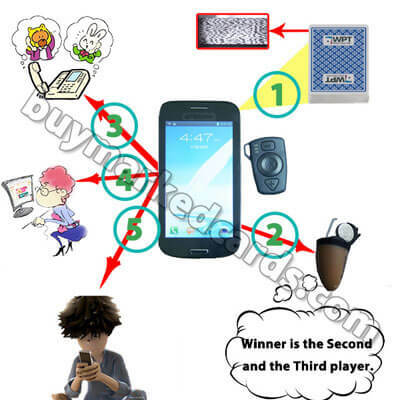 The smart poker analyzer device phone can send message, make phone call, surfing online, and own all kinds of smart phone's function. Tt can spy the barcode on the side of cheating playing cards and send the date to poker analyzer instantly. It is more advanced an-ti poker cheating device than before. Many functions like the poker report speed and setting rules have been improved, it can scan our best quality marked barcode cards and tell the winner and the second hand result within 0.03s via headset, which is very faster than normal poker analyzer system. And the poker scanning system also has fashion outlook. It is very easy to manipulate, make all the settings as the analyzer device instruction we give, you just need to put the poker analyzer with scanning camera inside on the table, it can receive the winner result by spy earpiece easily. It is just simple as wear the infrared contact lenses to see the marked playing cards. 1. You can choose the poker game program for poker analyzer as you need like: Texas Holdem. Omaha, Blackjack, Zecchinetta. 2. Single person operation, no need partners. Wear one spy earpiece you can work alone. 4. Poker winner result be reported within 0.03s. 5. Covert skin color spy earpiece.